KGHM ZANAM’s articulated wheel loaders are designed to transport excavated material from underground mines to the surface. The loaders can be used with other haulage vehicles, or as part of an autonomous haulage system. The vehicles’ closed capsule structure protects operators from falling rocks, and the sturdy cabins are available with air conditioning, for comfort over long hours in adverse environments. The LHD loaders are available with a selection of customisable extras, to best suit the needs of the operation. Loaders may be equipped with a central lubrication system, a hydro-pneumatic boom stability system, joystick steering control, a load weighing system and a remotely operated fire-extinguishing system. The 800 and 900 series also offer buckets that have a withdrawable partition. Haul trucks carry materials from the mine face to various handling points in mineral ore mines. 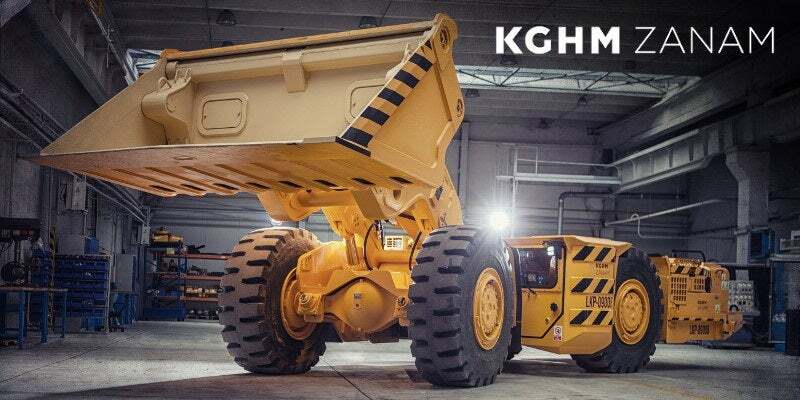 KGHM ZANAM’s haul trucks have an effective push-out unloading system, where the output is discharged from the box using a removable slide wall and a movable box. This system ensures that even the smallest amount of material is removed and the haulage box is completely empty for its next load. The push-out process eliminates the need to raise the haulage box, so the trucks have a fixed height and do not require raised galleries in handling points. Haul trucks are highly manoeuverable and ideal for narrow, difficult spaces in mine headings. The CB4-20TB 4×4 truck can be equipped with an optional drive system that has additional hydraulic motors installed on hubs so that, when the truck loses traction, the operator can activate the additional drive by transferring torque to the hubs. Self-propelled drilling and roof bolting trucks are machines with one working stand and one boom that drill blast holes and create expansion and adhesive anchors (roof bolting) in underground, methane-free mines. The key features of the trucks include the drilling rig’s telescopic boom and drilling frame, and the roof bolting rig’s telescopic boom and a bolting turret, which can be equipped with a rotary drill or a rotary / hammer drill. Both the drilling and roof bolting trucks have a shield protecting the operator from vertical impacts on the machine, and a stable assorted drive unit. Blaster trucks are self-propelled machines for underground, methane-free mines that do not excavate coal. The trucks have a driver’s cab and a cabin on the platform to carry two workers, for blast hole loading. KGHM ZANAM Foundry manufactures steel and iron castings that meet national and European standards. The high-quality materials and components used ensure that machine parts are abrasion-resistant for a long service life. KGHM ZANAM offers crushers and crushing sets in a variety of designs and purposes, to suit the operation’s requirements. Jaw crusher sets are designed to crush materials such as construction waste, basalt and granite, whereas impact crushers crush mineral materials of high and medium-hardness, such as granite, dolomite and limestone. They can also be used for recycling waste materials generated in the construction process, producing an aggregate with a high cubicity. KGHM ZANAM offers a range of new services to its customers, to improve machine performance and operational productivity. Many of the departments provide highly-skilled technicians to carry -out servicing, repairs, modernisation of equipment and training. KGHM ZANAM is one of the largest producers of mining equipment in Poland, supplying machinery to support salt, zinc and lead mines, amongst others. With an ever-expanding international network, KGHM ZANAM’s high-quality, robust equipment is distributed to customers in Russia, Kazakhstan, Germany, France, Estonia, Uzbekistan, Turkey and Pakistan. KGHM ZANAM SA is one of the largest Polish producers of machinery and equipment for the mining sector. The company also manufactures equipment used in handling systems, transportation units, stone mining and openpit mining. In addition, KGHM ZANAM is also a major producer of steel and iron castings. and Tests' for dynamic load of 60 kJ. The foundry specialises in manufacturing cast steel castings according to national and European standards, as well as its own specifications. KGHM Zanam offers crushing sets in design versions that are self-propelled, sliding or fixed. They also have optional compilations such as magnetic separator, sprinkler system, automatic lubrication system, etc. that are designed to individual customer needs. 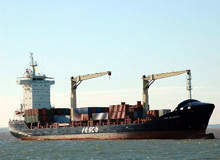 KGHM ZANAM has released a brochure detailing its LHD loaders, haul, blaster, face and auxillary trucks, and more services. Download the free brochure for more information.